John Tom Bend is one of the men named on the Bottesford ‘church list’ of WW1 servicemen. Elizabeth Robinson is sincerely thanked for the great assistance she provided in the researching of her grandfather’s life and family. John Tom (Thomas) Bend was born in April, 1876, in Easthorpe, Bottesford. His parents were William Bend, born in Bottesford in 1838, and Mary Ann Bend, born in Bottesford in 1841. William Bend was from an established village family. His parents, William Sansam and Rebecca Bend (neé Staines) had married in 1829 at Muston. In 1841, the census recorded that they lived in ‘King Street’, Bottesford. Their children at that time were William (born in 1832), George (1837), William (1838 – presumably the first William had died), Sarah Elizabeth (1841) and Thomas Francis (1843). William Bend senior had remarried by the census of 1851. His second wife was Hannah Briggs, born in Long Whatton in 1821. Their marriage took place on the 13th October, 1845. The children of this marriage were James (1846), John (1848), Harriett Briggs (1850) and Reuben (1863). William Bend junior (born 1838) was John Tom’s father. He married Mary Ann Gilding, daughter of Thomas and Elizabeth Gilding, in 1865. At the census of 1871 they had three children, Lizzie (5), Harriet (3) and baby William who was 7 months old. Their father worked as a railway labourer and the family lived in a cottage at Easthorpe. John Tom was born later, on the 15th April, 1877, and baptised on the 12th January, 1878, at Bottesford parish church. In 1881, the family lived at 1 Belvoir Road, Easthorpe, and William Bend worked as a platelayer. The children were now William (11), Sarah (8), Edith (6), John Tom (4) and Earnest (10 months). All these children were born in Bottesford. By 1891, they were still at I Belvoir Road. William Bend had been promoted to become railway inspector. The children at home then were John W (20), “James T” (14) [this is clearly an error by the census enumerator and the name should have been “John T”], Edward H (11) and Mabel (8). Elizabeth Robinson, grand-daughter of John Tom Bend, wrote the following account. “The 1901 census shows three members of my family working at the Nottinghamshire County Lunatic Asylum: John Thomas Bend, Edith Rebecca Bend and John Hunt. Edith Rebecca Bend (1874-1968) and her younger brother John (1877-1938) were two of the ten children of William and Mary (neé Gilding) Bend of Easthorpe, Bottesford, in Leicestershire. Most of Mary Gilding’s family were tall and fair, whereas the Bend family were of short or medium height and dark. Thus Edith Rebecca was named after her grandmother Rebecca Bend, as Rebecca means ‘the dark one’, whereas her brother John (Tom) was well over 6 feet tall with a fair complexion and hair. The Bends had lived in Bottesford for generations, but when William and Mary’s sons started looking for work in the 1880s and 90s nothing was available locally in the farming community. The older boys moved to Kirkby in Ashfield, Nottinghamshire, to become miners, but John Tom joined his sister at the County Asylum, working as an attendant. The 1901 census entry for the County Asylum, described as a Lunatic Asylum, stated that John Tom Bend was born in Easthorpe, Bottesford. He worked there as an Asylum attendant. The Asylum was situated on Carlton Road in Nottingham. John Tom Bend’s marital state was single. John Hunt was also a big man, six feet tall and solidly built. It looks as if all the attendants had to be big men in order to control the patients when it was necessary. John (Tom) Bend and John Hunt soon became friends, and when John Hunt married Edith Rebecca Bend at Bottesford Church, on April 5 1904, John Bend was the best man. In 1911, John Tom Bend had left the Asylum and become a boarder in Sculcoates, Hull, at 283 Hedon Road. He was still single and had started to work as a boatman and fisherman. In the summer of 1912, he married Edith Turner at Sculcoates, where they settled and rented a house together. They were to have three children: May born in the first quarter of 1913, John Tom (junior) who was born on the 17th January, 1915, and William who was born in 1922 after the war had finished. When the Great War broke out, John Thomas Bend was thirty-six, living in a tiny house at Sculcoates with his wife, Edith, and baby May, who was just fourteen months old. John was a fisherman, but suffered from ill health, having problems with his lungs, and often could not work. They were not well off, and like everyone else in the country, could not have imagined what lay ahead. There would be at least twelve occasions when bombs fell on Hull, and there were also alerts when Zeppelins flew over Hull on their way inland. They must have been terrifying experiences for the Bend family. John Tom had joined the East Yorkshire Regiment, and by July 1916 was “residing in India”, but he was so concerned at the thought of leaving his wife and children in Hull to face the Zeppelin raids that he suggested they stay with John and Edith Hunt at West Bridgford. The Bend and Hunt families had remained close, visiting each other when they could, and John Tom knew his wife and children would be well cared for, and, hopefully, away from any bombing. John Tom Bend was 36 when he joined the armed forces [therefore in 1912 or 1913, before the start of the war]. He became a private in the East Yorkshire Regiment, Service Number 13/1360. Previously, he had belonged to unit G.B.E. York R. Pte.13/1360h. His Medal Index Card indicates that he was awarded the British War Medal, but not apparently the Victory Medal. Soldier perched on the table has a standard tunic and a 1914 pattern belt on. The East Yorks badge is an 8 pointed star and this is more of that sort of shape – is this J T Bend? He does not appear to have any good conduct or overseas service stripes in this photo, so it was probably taken before he went overseas. He is also the only man who looks like he might be in his late 30s. The family notes state that he was in poor health with bad lungs and often couldn’t work. He would also have been 39 years old in 1916 – therefore, he hardly seems a candidate to be sent to India. 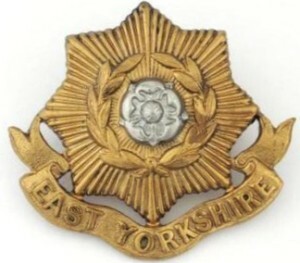 However, it is noted that his service number was 13/1360 and this would denote service with the 13th Battalion East Yorks. Their history is summarised as follows: 13th (Service) Battalion (4th Hull) – John Tom was living in Hull at this time and 10th, 11th, 12th and 13th Battalions were all the Hull Pals. respectively Hull Commercials (10th), Hull Tradesmen (11th), Hull Sportsmen (12th) and Hull T’Others (13th). This makes more geographical sense. Formed in Hull on 11 August, 1914, by Lord Nunburnholme and the East Riding TF Association, and commonly known as the T’Others! In June 1915 they came under orders of 92nd Brigade, 31st Division. 15th December, 1915, they were moved to Egypt, but went on to France in March, 1916. On the 8th February, 1918, the 13th was disbanded in France. It is therefore most likely that John Tom Bend served in Egypt and then in France with the 13th Lincolnshires, though his date of discharge and medical records have not been located. Mary Bend died in 1925. Probate indicates that her estate was valued at £214 8s 11d. Her husband William, now a retired railway official, was to be an executor of his wife’s estate, along with Ernest Henry Bend, collier. In William Bend’s will, dated February 22nd 1932, John Tom Bend was left a long case grandfather clock by his father. John Tom Bend died in December, 1938, aged 62, his death registered in Hull. Edith Bend died in December, 1962, aged 74.